Analyses Broad Notes Indian Writing in English Poetry Critical Analysis of Toru Dutt's poem, "Our Casuarina Tree" or Bring out the Autobiographical, Nostalgic and Spiritual Element in "Our Casuarina Tree"
of her as a marvellous young girl who died before her prime after blazing a trail of brilliance in early Indo-Anglian poetry. She was the first woman writer in the history of Indo-Anglian literature. She was also among the first to realize and affect the much needed rapprochement between the Eastern and the Western knowledge. Toru Dutt was undeniably the finest flower of Indian Renaissance that began with Raja Rammohun Roy- the tireless crusader for English education in India. The poem “Our Casuarina Tree” is a beautiful symbolic poem harmonizing both matter and manner in accurate proportion. The tree stands for a symbolic representation of Toru’s past memory. Apparently it symbolizes the rich tradition of Indian culture and philosophy which played an important role in shaping the poetic and aesthetic sensibility of the poets. In Keats’ “Ode to a Nightingale”, the bird symbolizes the world of art and beauty. In Shelley’s “To a Skylark”, the bird is the symbol of freedom and liberty. Similarly, in Toru Dutt’s “Our Casuarina Tree”, the tree connotes the nostalgic feelings and memory of Toru Dutt. This is the tree under which she played with his brother and sister- Abju and Aru. So the very thought of the tree transported her to her golden past days. In the first stanza she imagined the rugged trunk of the tree to a huge python winding round and round. The creeper has indented deep with scars up to the top of the tree. One may also sense a similarity between the tree in the clutches of a creeper attempting to sap its strength and the three young Dutts in the grip of a killer disease – tuberculosis. Toru says the flowers of the tree are hung in crimson clusters. Toru tells us that her Casuarina Tree, a haven for the winged, birds and insects, is almost visibly alive, alive with the buzz of bees and with the chirping of birds. This song sung from the tree soothes its listeners and has a tranquilizing effect on men who relax and rest as the bird sings. The second stanza is replete with the pictorial and visual imagery of the tree and the gray baboon and his offspring. In winter a gray baboon used to sit on one of the branches of the tree watching the sunrise. On the lower branches, the offspring of the baboon used to leap about and pay. Gradually, as the sun rises, the “kokilas” begin to greet the day with their song and a mesmerized Toru Dutt watches “sleepy” cows that have not yet shaken off their lethargy, on their way to the pastures. The beauty of the tree is no more than an added gift. Its actual importance lies in the fact that it is a part of the Dutts’ existence, a reminder of family ties, of the warmth shared by three siblings. The Abju-Aru-Toru bonding was indeed strong and in Sita Toru mentions, “Three happy children…” sitting in a dark room listening to a story and then sighs because she knows that they will never again “by their mother’s side/Gather”. Like Keats, she had to suffer a lot. She had seen bitter struggle for life and death, untold miseries after the death of her beloved brother and sister. The fourth stanza is highly philosophical. The poet observes “Unknown yet well-known to the eyes of faith”. Here the term ‘unknown’ denotes not simply the native home of the poet but also the world of the departed soul. A man who has the eye of faith can see the unknown as well-known. Yoga also says that when a man has an unwavering faith in the existence of the divinity through the art of meditation and poetry, nothing remains unknown to him in the universe, because he lives on the plain of consciousness, usually felt as vacuum of the transcendental stage of smadhi. This is what exactly Toru Dutt feels here. Interestingly Toru’s mystical and spiritual approach to poetry is centered to her profound knowledge of great Sanskrit epics and scriptures. The music which Toru refers here is not an ordinary music which we hear in our day to day life; it is music of the soul, which once it is attained, never dies and continues to vibrate with the highest percipience in the mind of the seeker. Toru Dutt is not like the “Skylark” of Shelley, “the scorner of the ground” but she is the “Skylark” of Wordsworth “a pilgrim of the sky” and does not despise the earth where cares abound. At the end of the poem she absolutely transcends the mortal, materialistic and mundane frame of mind and attains the power of love to overcome the negative forces of life like death and darkness, terror and fear. In this stanza, the words and the phrases like ‘trembling hope’, ‘love’, ‘death’, ‘the skeleton’, ‘and oblivion’ are very suggestive. She means to say that a man of unflinching love and devotion never fears the blows of death. Toru does not express any desire to fade “far away” and “dissolve”. Their Casuarina tree does not make her long for “easeful” death. Instead, even though its “timelessness” mocks the transience of the human world, the tree is to her a support, a reminder of the joy she once experienced with Abju and Aru. So, in the final stanza, Toru Dutt, aware both of Druidism and the customary tree-worship in India, wishes to “consecrate a lay” in the Casuarina Tree’s honour. 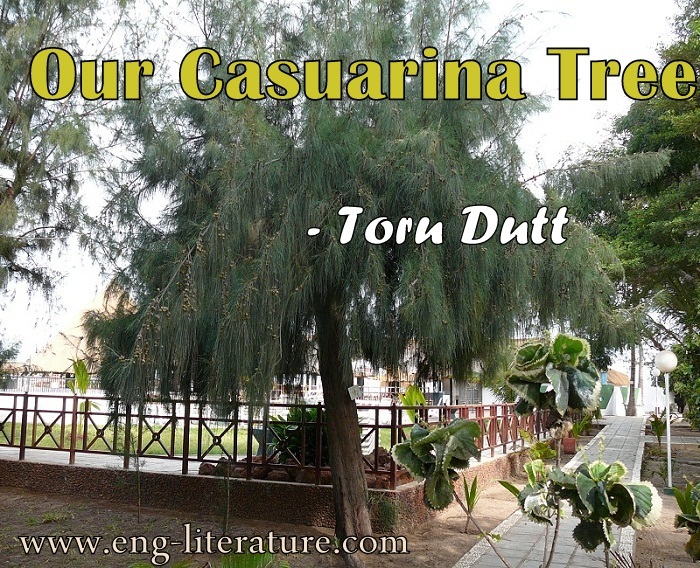 To sum up, the poem “Our Casuarina Tree” shows a perfect blending of feelings and forms, matter and manner. It contains what Eliot means by his phrase “unified sensibility”. It is a combination of both the East and the West. In form, it is very near to the Romantic and the Victorian poems. In theme it dives deep into the unfathomable ocean of the Vedanta and the Upanishad of body and soul, life and death.